Tennis History | Find all there is to know about tennis here! Tennis is a racket sport that was actually invented in the 11th century by a group of monks monks. Back then, it was nothing like it is today. They played with their hands instead of rackets. Quite often they would juggle a ball against the wall with their palms during their spare time. 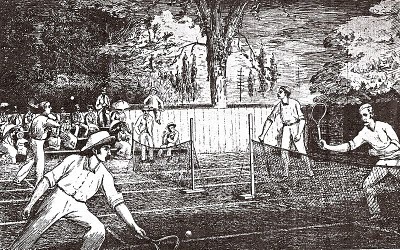 Tennis began to truly develop and by the 1870’s it resembled the game we know today. In the 1880’s King Gustav V brought tennis to Sweden and started a Tennis club that became known as KLTK, the Royal Lawn Tennis Club. Tennis grew from the 1900’s and started spreading throughout the world. In the 1980’s the wooden rackets used previously were progressively replaced by the more lightweight graphite rackets. Graphite rackets were lighter and stronger than their wooden counterparts and that meant it was easier to hit the ball and play a wider range of shots. Today, tennis is played by players all over the world from various ages, proving that anyone can play this sport. It is not as stressful as you might have been led to believe by watching players such as John McEnroe over the years. Doctors recommend tennis as a leisurely sport intended to keep you fit, healthy and active. There are millions of people who play tennis, it’s the world’s second most played sport and it is widely available if you just want to watch on TV. Many thousands of people sit around a Television watching big tournaments every year, sometimes finding themselves on the edge of their seats with excitements as players like Andy Murray and Novak Djokovic battle it out to become the best.